The ancient religious text of the Te Deum is usually set to music for a joyous or celebratory occasion such as a coronation or a great victory. The Te Deum of Walter Braunfels is neither liturgical nor celebratory. Rather, it is the reaction of a German nationalist and disciple of Pfitzner to first-hand experience of the trenches of the First World War. This experience transformed patriotism and martial ardor into love of humanity and of God. Braunfels’ setting is a journey “from darkness to light” as the composer comes to terms with his wartime experiences. It was premiered in Köln in 1920 under Hermann Abendroth. The composer divides the text into four sections united by a descending motif first heard in the work’s orchestral introduction and a more consolatory variant of this original theme. The latter is usually sung by the soprano and tenor soloists. The tempo marking of the first section is “feierlich, breit” (festive, broad), but the tone speaks of supplication, rather than victory. The succeeding Sanctus is more reassuring, but the chorus Te Martyrum which follows is explicit in its warlike terror before the entire section ends with imploring prayer. The Judex crederis section shares rhythmic and even thematic material with its counterpart in the Berlioz Te Deum (cf. Braunfels’ Phantastiche Erscheinungen eines Themas von Hector Berlioz). Where the Judex of the Berlioz is a solemn and impressive march, the Braunfels is a dance of death. The Te ergo quaesumus feels more positive, but this mood quickly vanishes with a return of the Judex material. The orchestral introduction to the Aeterna fac section is based on the work’s original descending motif combined with the rhythm of the previous Judex episode. Gradually, the music broadens to become more reassuring with the soprano and tenor singing the Benedicamus, laudamus, te to a triumphant variant of the Judex material before the music again dies away. The Dignare domine music returns to the mournful mood of the work’s opening with the chorus also commenting on what has gone before. This features excellent writing for the chorus. The woodwind writing that follows in the In te Domine speravi is equally fine. The music gradually becomes confident and serene, leading to the final, reassuring, In aeternam, sung by all. This recording is a re-mastered version of a radio broadcast in honor of Braunfels’ 70th birthday. It was previously available in the Gunter Wand Edition on Profil PH06002, but even with the re-mastering on Acanta the text is frequently unintelligible and the distortion and background noise quite pronounced. On the plus side we have the young Leonie Rysanek in full glory and a very committed performance by the Gürzenich Choir. 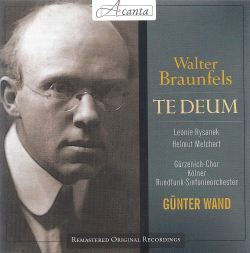 Presiding overall is Günter Wand, a major advocate for Braunfels, in one of his most stirring performances on disc. Manfred Honeck recorded the Te Deum in 2008 on Orfeo C679071A and this is a very fine performance, as well as having up-to-date sound, but the 1952 recording is a stand-out, if only for the roles played by Rysanek and Wand.